Delivering the superior performance you need. Mantic Clutch offers a full range of 4Terrain clutch kits ideal for the Nissan Patrol. Whether you’re on the job or doing some extreme four wheel driving, our systems deliver the torque you need while still providing a great pedal feel. We believe every driver deserves to get the best from their vehicle. 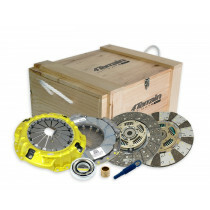 That’s why we offer a superior selection of performance clutch kits to suit your application. However you drive and whatever your budget, you’ll find a high-performance kit here that’s perfect for you. Discover what real driving is and browse our catalogue today. There’s no tougher choice than a 4Terrain by Mantic Clutch. Built in a state-of-the-art Australian facility by qualified and experienced engineers, our range of clutch kits are the product of tens of thousands of hours of research and development. Offered in different disc configurations, our clutches have been built to deliver the highest levels of torque capacity, the best heat dissipation and all while retaining excellent pedal feel. No matter how hard the road ahead of you is, you can count on our range of performance heavy duty clutches to see you through. Mantic Clutch has more than 65 years of engineering experience behind them, engineering all of our clutch kits in our state-of-the-art R&D and manufacturing facility. With a focus on quality at every stage, our clutch kits are perfect for those looking for enhanced durability and toughness and greater levels of precision and performance. Browse our collection of clutch kits and transform the way you drive with Mantic Clutch. There’s no better choice for your vehicle than Mantic Clutch. However and wherever you drive your Nissan Patrol, rely on our range to make every second on or off the road feel more meaningful than ever before. Order online for fast delivery anywhere in the world, or start a conversation with our team members to learn more about our range of clutches. Send us your questions via our contact page.